At the pre-race meeting of the 2008 Tour Divide, the 17 racers (including myself) were briefly introduced to Anthony Camino and Hunter Weeks who—along with racer Mike Dion—were going to produce a documentary about the Canada-to-Mexico mountain bike race. Twenty-two months of hard work later, the 1.5-hour movie entitied Ride the Divide premiered at the Vail Film Festival. And I’d say it was worth the wait! Their stories were compelling and captured several emotional moments of racers confronting psychological demons, abandoning, etc. There were also many comedic moments in the film. The audience at the world premiere—which packed the viewing room to the point where people had to stand or sit on the floor—really got into the movie, even applauding at the point where Mary re-entered the race after calling it quits. And did I already say the cinematography was gorgeous? I cannot emphasize this enough! The movie really captured the splendor of the mountains, sunsets and cloud formations of the Great Divide. The sheer beauty of the GDMBR is a good enough reason to watch the film even if you aren’t a cycling enthusiast. My only disappointment was that I was shown for a mere half second at the beginning (at 4:28 in the film), right before the opening title rolled onto the screen. In the cameo I was sitting on a chair at the pre-race meeting. I was literally the only finisher of the race who wasn’t shown on a bike or acknowledged until the closing credits. This was not a surprise to me because during the race I was out there all alone and I never saw the camera crew after Day 1. Apparently, around Day 10 and Day 11 the crew waited for me after Mike told them I had passed him and was somewhere behind Adrian. They never found me and as Anthony said, at some point they had to run with the story lines they had going. Nevertheless, the movie brought back lots of memories of the most beautiful thing I have ever done, and in my biased opinion was the greatest documentary I have ever seen. I rate it five stars! 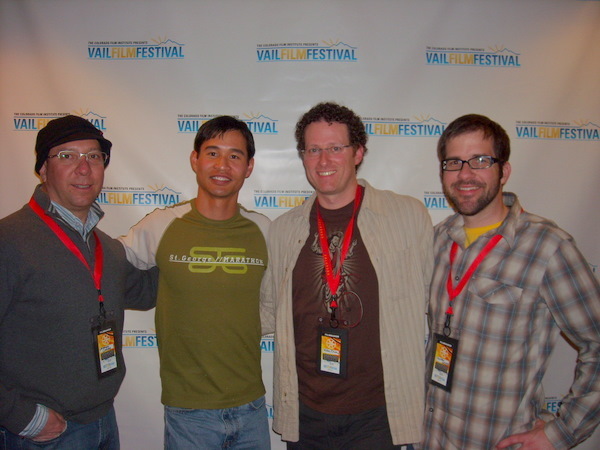 Update April 4, 2010: The movie won the “Best Adventure Film” award at the Vail Film Festival! Glad to you know you liked it… and people are still cheering for me! I told Stephen, when he sees it, he will want to do it again; It has that draw! Can’t wait to follow you next time you’re out there. Well done for your accomplishment Felix. Your call-ins were always interesting. I really look forward to checking out the Movie, shame you didn’t make an appearance, like you say.